Is your Santa Fe Springs water heater leaking? There is nothing worse than that sinking feeling of coming home to find water dripping from your ceiling. If you've got a leak, it is quite possibly due to a burst water heater in your attic. Water leaking from a heater should be handled quickly to avoid extensive additional damage caused when water seeps into ceilings, floor boards and behind walls. If you have a leaking water heater unit in Santa Fe Springs California, call the experts at West Coast Restoration Inc for a quick response. We have been resolving water damage issues caused by heaters leaking for more than 29 years. Call (714) 584-4894 for expedient dry out services. Water Heater Leak in Santa Fe Springs? Don't Wait! 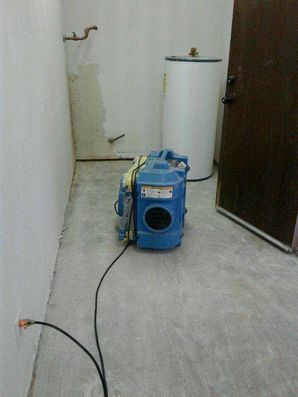 When you've got water damage in Santa Fe Springs from a leaking water heater, call the dry out professionals at West Coast Restoration Inc.